– OSAGYEFO KWAME NKRUMAH, ‘Africa Must Unite’, 1963. Kofi Mawuli Klu ‘Charting an Afrikan Self-Determined Path of Legal Struggle for Reparations’: A Draft Paper for Presentation to the 11th December 1993 Birmingham Working Conference of the African Reparations Movement, UK, 1993. This workshop will explore the meaning of the theme for the 5th annual Afrikan Emancipation Day Reparations March on 1st August 2018: ‘Nothing About Us Without Us: Actualizing the Reparatory Justice Change We Envisage.’ The main question we will discuss is: What kinds of tackling of problems and injustices that Afrikan people encounter can be deemed as the everyday repairs starting point of reparatory justice work? In this regard, we will highlight the outreach and other mobilizational work of the Afrikan Emancipation Day Reparations March Committee (AEDRMC), in association with the ‘Stop the Maangamizi: We Charge Genocide/Ecocide!’ Campaign (SMWeCGEC) with a view to making people see themselves as the actual ‘makers’ and ‘drivers’ of reparatory justice rather than being passive recipients of the benevolence of government and other state actors. This kind of thinking in views expressed by the likes of CARICOM Reparations Commission, Chairperson, Professor Sir Hilary Beckles when he reportedly stated in a recent interview published in the Barbados Advocate (12/07/18):“…reparations is ultimately a government to government conversation. It is about how governments talk to each other. How governments sit down and work out strategies to resolve issues of this nature.”. In this connection, this workshop will also further explain the revolutionary substance of the rationale for the Reparations March given in the following video. The difficulty of grasping reparations differently from what the white supremacist racist establishment defines it to be for us as Afrikan people, is largely as a result of miseducation and the coloniality of our mindsets in even how we are made to think about the cause, nature, consequences and solutions to the problems and injustices that we are encountering as a result of the Maangamizi (Afrikan Hellacaust). It is still largely the case that many who claim to be pro-reparations are inadvertently merely ‘supporters’ or reparations; waiting for the day when someone is going to say “here is your reparations,” or when they and/or Afrikan and Caribbean nation states receive some award of compensation from the British and other European Governments. The whole notion of exercising agency in conceptualising, effecting, securing and taking reparatory justice is completely absent for most of our people, across the world, who are sympathisers or adherents of the cause of reparatory justice. Taking into account the criticism some establishment scholars make of Black reparations activism, in terms of not seeing its revolutionary tendencies, this workshop will therefore highlight those constituencies of the International Social Movement for Afrikan Reparations (ISMAR), like PARCOE and the Global Afrikan People’s Parliament (GAPP) that advance radical change-making perspectives. Examples of such perspectives are: the concept and methodology of Pan-Afrikan Reparations for Global Justice which embraces the world revolutionary transformational strategy of ‘Maatubuntusa’ (the art of Pan-Afrikan revolutionary freedom- fighting) for achieving MAATUBUNTUMAN. MAATUBUNTUMAN is the name being popularised for the envisaged future Pan-Afrikan Union of Communities, championed by PARCOE and GAPP and the Global Afrikan Family Reunion International Council (GAFRIC) in Ghana. Coined from the conjunction of “Maat” (the holistic Justice concept from Kemet, Ancient Egypt), with “Ubuntu” (the Bantu concept of the Communion of Humanity from Southern Afrika) and “Oman” (the Akan concept of egalitarian Polity from West Afrika). MAATUBUNTUMAN promotes the concept of a global Afrikan polity (“Oman”), which is an organic embodiment of “Maat” and therefore practices “Ubuntu” in relation to her own citizens and the entirety of Humanity, Mother Earth and the Universe. Esther Stanford-Xosei is a jurisconsult, community advocate specialising in the critical legal praxis of ‘law as resistance’ and internationally acclaimed Reparationist. She is the official spokesperson for the Afrikan Emancipation Day Reparations March Committee (AEDRMC) which organises the annual 1st August Reparations March in London. In addition, Esther is the co-initiator of the ‘Stop the Maangamizi: We Charge Genocide/Ecocide!’ Petition and its wider campaign (SMWeCGEC). Esther also serves as the Co-Vice Chair of the Pan-Afrikan Reparations Coalition in Europe (PARCOE), co-founder of the Global Afrikan Peoples Parliament (GAPP), the Afrikan Reparations Transnational Community of Practice (ARTCoP) and the Europe-Wide NGO Consultative Council on Afrikan Reparations (ENGOCCAR). On behalf of PARCOE, Esther and other PARCOE members are involved as an activist partner in the building process of the International Network of Scholars & Activists for Afrikan Reparations (INOSAAR). Oleye Gege is an emerging grassroots community scholar-activist, community radio broadcaster who promotes participatory approaches to effecting community self-repairs and addressing the intergenerational impacts of the psycho-social manifestations of the Maangamizi. He serves as the head of security and outreach facilitator on the Afrikan Emancipation Day Reparations March Committee and advocate of the ‘Stop the Maangamizi: We Charge Genocide Ecocide!’ Campaign (SMWeCGEC). He is also a member of Afrikan Reparations Transnational Community of Practice (ARTCoP) and the International Network of Scholars & Activists for Afrikan Reparations (INOSAAR). Kofi Mawuli Klu is Chief Executive Commissioner of PANAFRIINDABA, a grassroots Pan-Afrikan Community Advocacy, Research and Think Tank based in London, UK and Accra, Ghana. He is also co-Vice Chair, Pan-Afrikan Reparation Coalition in Europe (PARCOE) in London and Joint Co-ordinator of the Global Justice Forum based in London and a founding member of the Global Afrikan People’s Parliament. Bro Kofi runs his own Law-Related Educational Services Agency, UEQUIPOISE. His scholarly activism has and continue to make a significant contribution within institutions of education in and outside of the UK [various courses, seminars, workshops, conferences and Groundings on Afrika and Pan-Afrikanism] and serves Afrikan students/communities as a conscientising tool for grassroots resistance and social change. Please Spread The Word, Attend And Bring A Friend! This entry was posted in AEDRMC, AFRIKAN HELLACAUST, AFRIKAN RESISTANCE, INTERNATIONAL SOCIAL MOVEMENT FOR AFRIKAN REPARATIONS, ISMAR, MAANGAMIZI RESISTANCE, MAANGAMIZI RESISTORS, PREFIGURATIVE POLITICS, REPARATIONS, SMWeCGEC, STOP THE MAANGAMIZI CAMPAIGN, THE 2018 AFRIKAN EMANCIPATION DAY REPARATIONS MARCH and tagged 1st August, Afrika, Afrikan Heritage, Afrikan Liberation, Afrikan Sovereignty, APPCITARJ, Black Radical Imagination, British Colonialism, British Government, CARICOM, Cognitive Justice, Commission of Inquiry, Ecocide, Education is Preparation for Reparations, Emancipation Day, GAFRIC, GAPP, Global Afrikan Family Reunion International Council, Global Afrikan People's Parliament, Global Apartheid, Grassroots Leadership, Grassroots lobbying, Hellacaust, International Social Movment for Afrikan Reparations, ISMAR-Building, Maangamizi, Marching, Movement-Building, Neocolonialism, Pan-Afrikan Revolution, People Power, Peoples Tribunal, Rematriation, Reparations Action-Learners, Reparations Education, Reparations Footsoldiers, Reparations March, Reparatory Justice, Repatriation, Self-Repairs, Social Movement, Stop the Maangamizi, U-PITGJ, We Charge Genocide/Ecocide!. Bookmark the permalink. 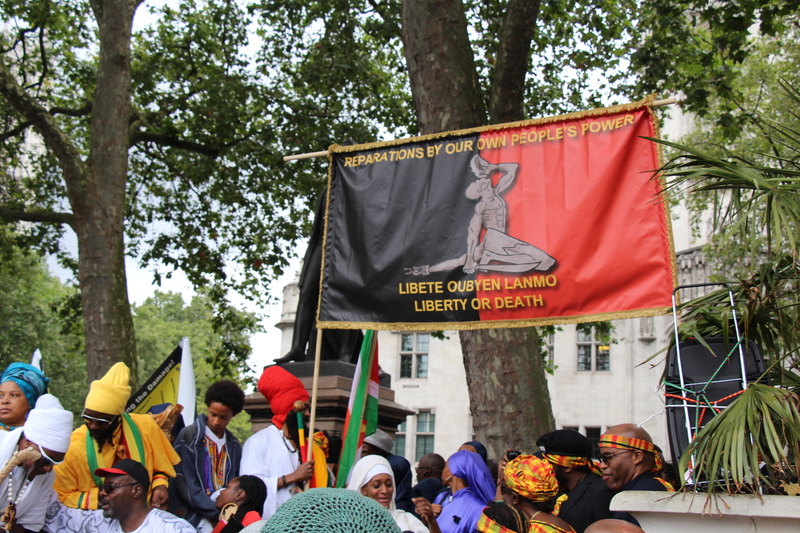 ← HELP TO BETTER TELL A PEOPLE’S ‘OURSTORY’ OF THE AFRIKAN EMANCIPATION DAY REPARATIONS MARCH!